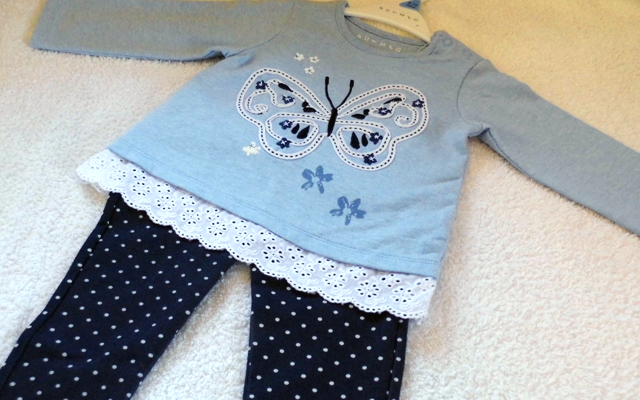 I don't know about you but I love baby and children's clothes. In fact, I would even go so far as saying I get jealous about some of them. They're just so cute and funky! So when Bo was given what can only be described as a haul of clothes from one of my family members, I knew I had to take photos of them and show them to you all! 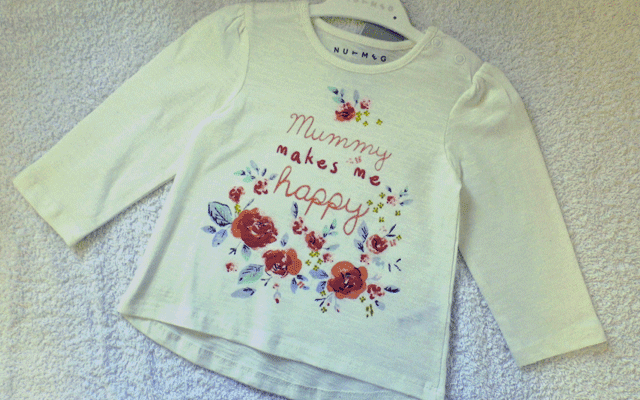 All of the clothes are from Nutmeg at Morrisons, which is one of my favourite places to buy clothes for Bo due to their good quality and low prices in comparison to a lot of other brands. 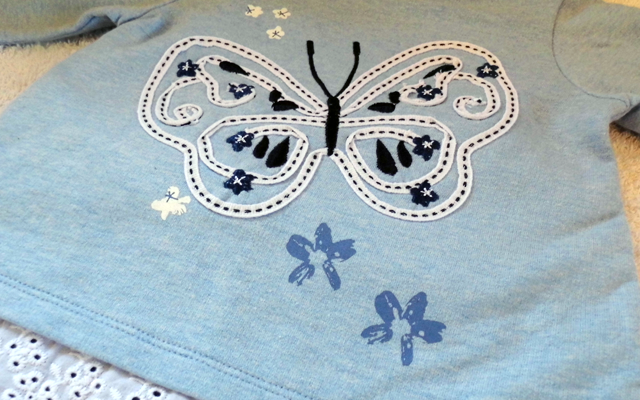 They also do some really pretty designs and regularly change their stock so you will find new things to buy every couple of months (my poor bank!). 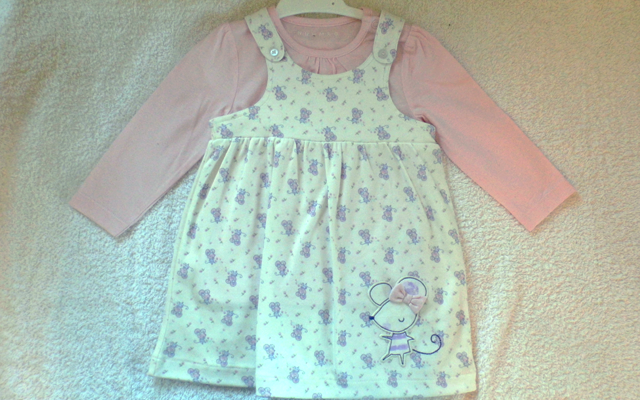 This cute little pinafore dress with long sleeved vest underneath is super girly. I love the little mouse in the bottom corner. My only slight issue with this outfit, practicality wise, is that the materials are quite light shades of cream and pink making it a magnet for food stains! I think this, particularly the pinafore, will have to come off at meal times. Either that or I will just have to get over it and accept a few stains here and there! 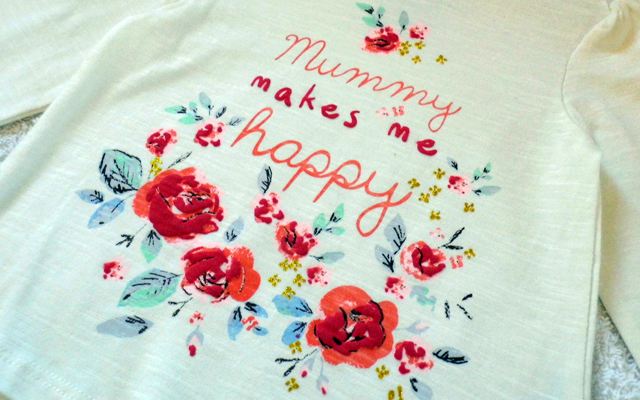 This top makes me smile - because who doesn't want to be reminded that you make your baby happy?! It's made of a light, slightly floaty material which, although perhaps not that suitable for the colder weather we are having at the moment, means that it will be great for when the sun is out and the weather gets warmer. However, it could also work layered up on top of a long sleeved vest if you really want to use it when the weather is that bit colder. 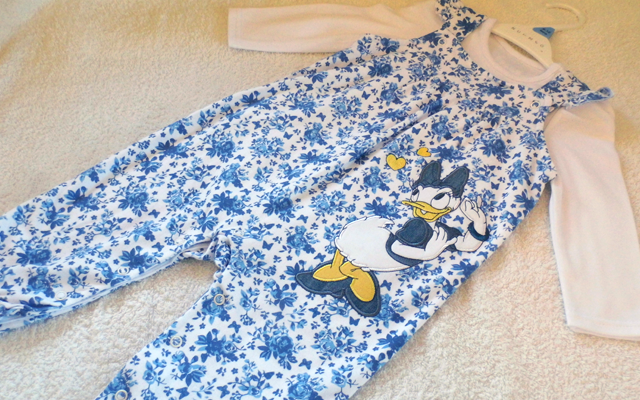 This romper suit is a Disney brand, meaning that this was the most expensive of the lot at £10. It is made of quite a light, stretchy material that makes it easy to move around in (although it is slightly too big for Bo at the moment and her feet get lost inside it!). The white long sleeved vest underneath can be swapped out for another one, if you want to, but I quite like it as the material that the romper suit itself is made up of is quite busy. 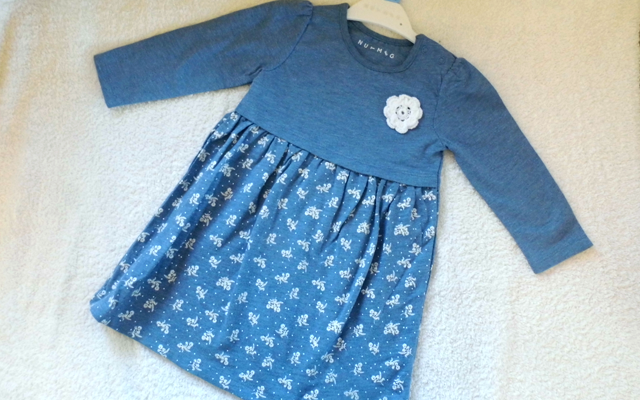 This blue dress is Bee's favourite of the lot. Again, it's a quite light, stretch material making it easy to move around in and has a really cute little flower attached to the chest section. Being made of a darker material, this is much better for hiding the inevitable stains that come with childhood, making it perhaps a little more practical than the other items so far. I really like the pretty design of this outfit, especially the frill of lace at the bottom of the top. 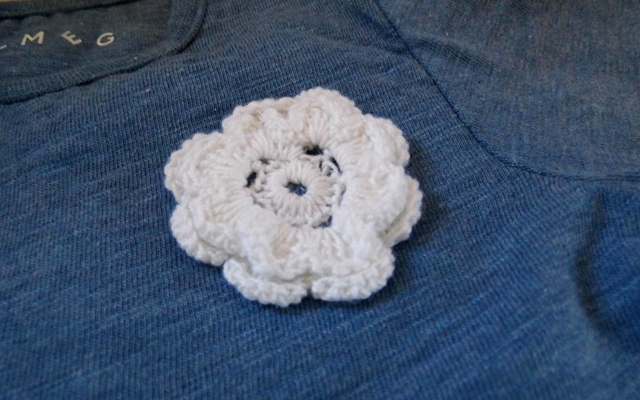 I think little lace sections like this are wonderful for making items look really girly in a really simple way. The spotted trousers are full length and reasonably thick which, along with the long sleeved top, makes it an ideal outfit for the colder weather. 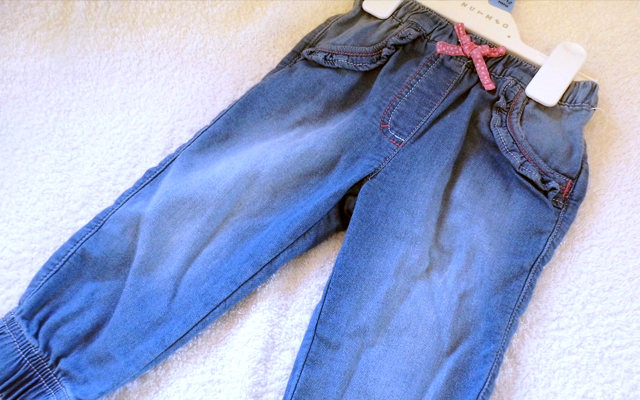 These little jean style trousers are really cute - especially the bow at the waist. 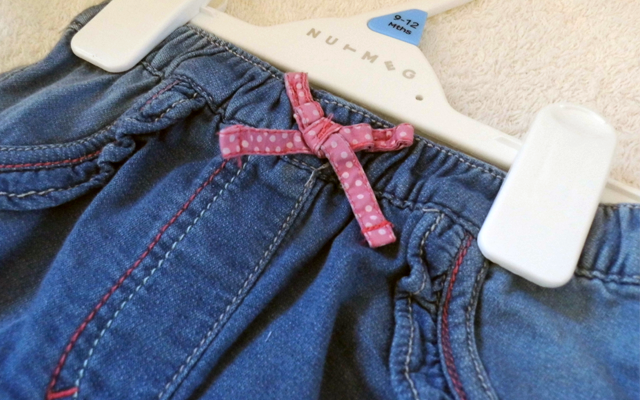 They are actually made of a really soft material, which is nice and light, instead of a heavy denim which makes them perfect for a crawling baby. Which is your favourite item of the lot? 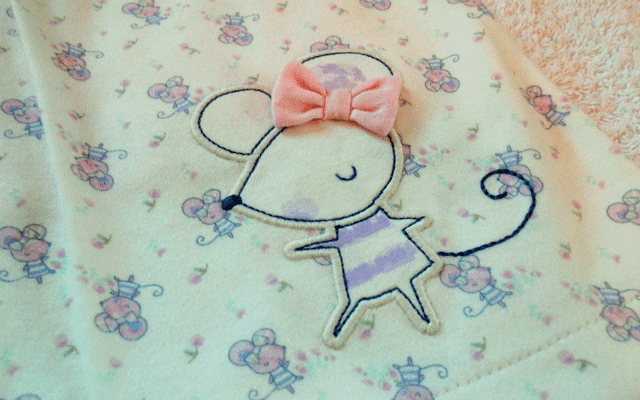 Do you have a particular brand of baby clothing that you like to buy? Let me know in the comments below! They do some lovely stuff! You will have to send me a link or put it here if you get any and blog it! 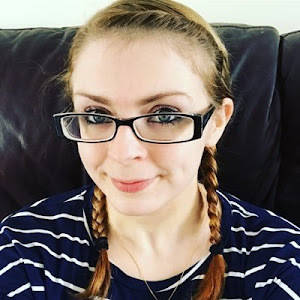 Love your baby fashion posts! What a gorgeous haul. 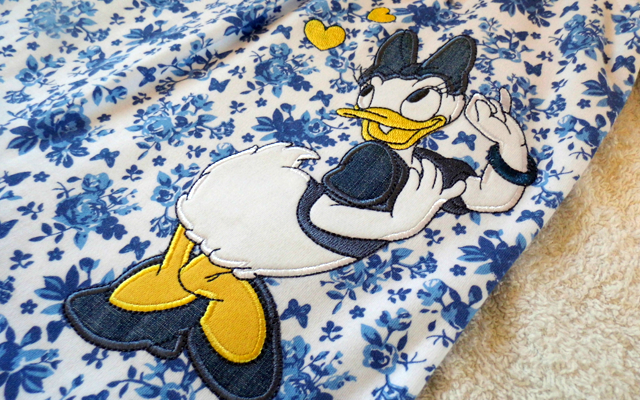 I love the Daisy Duck outfit the blue flowers remind me of a Dutch Delft blue design. Beautiful!